Before our travels to pick up Bookworm5 I found myself scouring Amazon for free books on Kindle. Most free books on Kindle are a nice thought that I'm not interested in thinking about. 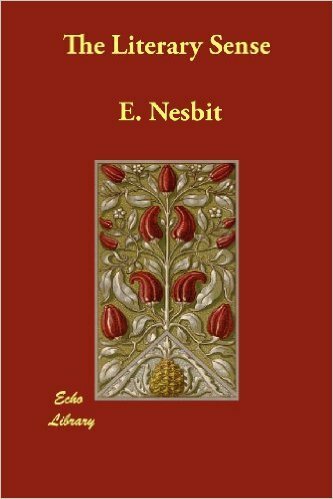 However, I did discover that there are a plethora of E. Nesbit books available at no cost and so I proceeded to download every single title of hers that I saw. One such title was The Literary Sense which I recently completely. Now, I have grown to adore reading Nesbit's books both by myself and with my kids. She was a fairly prolific writer which is an exciting fact if you love her books. I repeat: most of her books (if not all?) are available for free download on the Kindle which is a double treat and one that I highly recommend you take advantage of. I'd not heard of The Literary Sense before but I don't feel very badly about that seeing as how hardly anyone else has either. (Not even one Goodreads review?! And nothing on Amazon. Tsk, tsk!) I launched into the story, oblivious to what I mind find, and found myself delightfully surprised. The Literary Sense is a collection of short stories definitely not intended for children. There are adult themes running throughout this book and its clear from things that Nesbit found a great deal of merriment in poking fun at her fellow human being. In these stories, which function more as character sketches, Nesbit tickles her own funny bone by pointing out the irrational behaviors of others who suffer from a case of having a "literary sense" (aka a sense for the dramatic). The people she wrote of are always just a little bit over the top in their beliefs and actions towards the realities of life. With Nesbit's typical wit the reader can easily see how silly some folks can be when desperately in love. There is a certain degree of the preposterous running throughout which makes for entertaining reading. Nesbit most certainly had to have chuckled her way through the creation of this book and there seems nothing better to do than to laugh right along with her. If you don't, you'll miss out! If you like Nesbit in general, you'll want to check out this title because it offers another side to her as a writer. Whether the characters are likable or not is a matter of debate. They aren't really meant to be liked so much as humored. The romances of the foolish generally produce wry smiles so its fair to suggest that you expect to have a wry smile on your face as you read along. The Literary Sense sounds like fun, to me. Will keep this rare book in mind sometime. Thanks! I ordered The Railway Children, with fond memories of The Boxcar Children when I was a child. I've started reading The Railway Children, and enjoying it very much! Not at all like the Boxcar Children (as I remember it) but perhaps more like The Five Little Peppers (in that they were poor and their mother was rearing them alone). It has very serious themes told from a child's perspective. I do plan to order more E. Nesbit books. I love books like this. Also E. Nesbit is great!